When Martin Danelljan defends his doctoral thesis in a few weeks’ time, he will already have published more than ten scientific articles, and been cited more than 2,000 times. Together with his colleagues, he has been a pioneer in developing effective methods for object tracking, a hot topic in AI research. Face recognition Credit: Martin DanelljanComputer vision is a research area attracting more attention than ever before, as a consequence of an increased focus on autonomous vehicles and a newly aroused interest in artificial intelligence and machine learning. The technology of computer vision for autonomous systems made the transition from research lab to practical use a few years ago. It is used in cars to discover pedestrians that suddenly appear or road signs, in flying vessels that scan for people in need of help in disaster areas, and in mobile phone cameras to focus automatically on a face in the image (if any), just to name a few examples. Martin Danelljan ended up working in this field almost by coincidence: he was looking for a degree project with a mathematical and theoretical basis in a field that would allow practical application of the work. Michael Felsberg, professor of computer vision, offered him a degree project within visual object tracking, which is the technique used by a computer to follow a moving object that appears to grow and shrink as the distance from the camera changes. The degree project, which discussed different methods for object tracking, was of such high quality that it won a prize, and opened the door to employment as a doctoral student at LiU. Together with Michael Felsberg, Fahad Khan and Gustav Häger, Martin also won a prestigious competition in 2014, the Visual Object Tracking Challenge. He is author or co-author of more than ten scientific articles describing the work, all of them frequently cited. The total now is over 2,000 citations, with the two most highly cited articles Martin Danelljan Photo credit: Monica Westmanhaving more than 500 citations each. “We have made sure that we publish both the code and the applications, so that other researchers have been able to build on our results. Several of the research groups working in the field today base their work on code that we have put into the public domain,” says Martin Danelljan. Michael Felsberg is extremely happy that he offered Martin employment. “The results he has achieved are world-leading and are highly significant, both for the field of research and for my own research group. This is very gratifying for me as supervisor, and I’m proud of what my doctoral student has achieved,” he says. Interest in AI and the associated field of computer vision has exploded. The number of scientific articles published within computer vision and object tracking has increased immensely since Martin Danelljan started his doctoral project. He has spent the most recent few years refining the methods for object tracking and making them more robust, and this is the work that he describes in the doctoral thesis. “We teach the computer to follow a certain region in an image, which can be anything from a face to a football. The computer learns the appearance of the object and uses deep learning, among other techniques, to learn more about it as time passes. We can also use previously collected datasets to teach the computer to detect, for example, a person, and we can use various features in the image to make the object tracking more robust,” says Martin Danelljan. He demonstrates the results by holding up his own open hand and moving it back and forth in front of the computer camera. The computer manages to keep following the hand as it is clenched and rotated. He also shows a recorded sequence in which the computer follows the face of an energetic football player with a huge winner’s trophy in a sea of equally energetic and wildly waving teammates. The trophy occasionally obscures large parts of the face that the computer is following, but even so the computer follows the face without problems. “It’s not difficult for us to follow, for example, a person in a crowd, but this is extremely difficult to automate. The technology of object tracking has interesting applications in robotics, autonomous vehicles, games development, and many more areas,” he says. 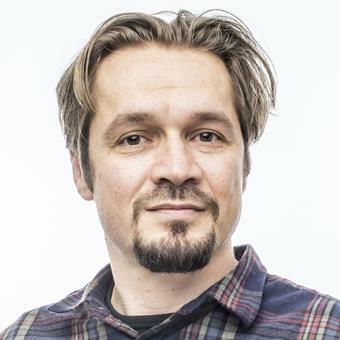 Martin Danelljan has collaborated in parts of the doctoral project with Fahad Kahn and Patrick Doherty, professor in AI. This has dealt mainly with flying drones which must be able to detect and follow people in need of assistance from far away. The project has been financed by the Swedish Foundation for Strategic Research (CUAS). Other parts of the research have been financed by the Swedish Research Council (EMC2), and Martin has also taken part in research schools organised under the auspices of the WASP programme. Martin Danelljan will defend his doctoral thesis on 11 June 2018. After this, he and fellow doctoral student Mikael Persson are to try their wings in the newly established company Singulareye, where they will collaborate with, for example, Swedish app creator Just Football. WASP is an acronym for “Wallenberg AI, Autonomous Systems and Software Program”, a ten-year research initiative with financing from the Knut and Alice Wallenberg Foundation. Linköping University is coordinating the programme. Learning Convolution Operators for Visual Tracking, Martin Danelljan, Computer Vision Laboratory, Department of Electrical Engineering, Linköpings universitet 2018.